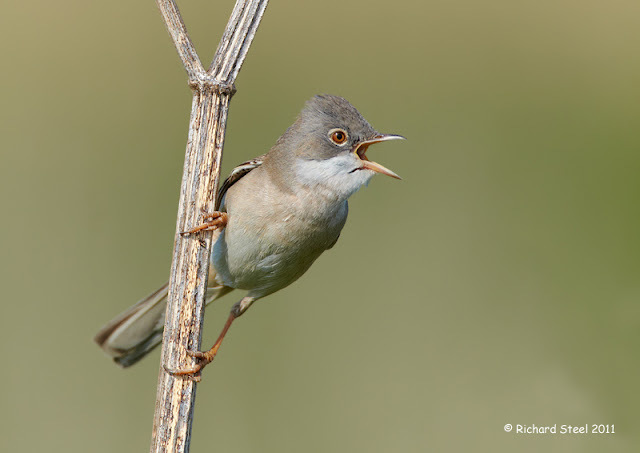 The Common Whitethroat is another migrant warbler to the UK which tend to arrive in my local area from around mid-April. Generally they are a bird that loves to skulk around in low shrubs and deep vegetation. However, when they first arrive the male will take up song perches to establish their territory and attract a mate and this is the key short time window for taking photographs. They often give away their location by a noisy fluttering song flight between their regular song perches. One feature of their behaviour which is in the photographer's favour is they seem to have an insatiable curiosity. If we take an example, try and picture yourself out at first light on a late April morning. You hear the distinctive scratchy warbling of a Whitethroat and spot the bird perched on a low shrub. 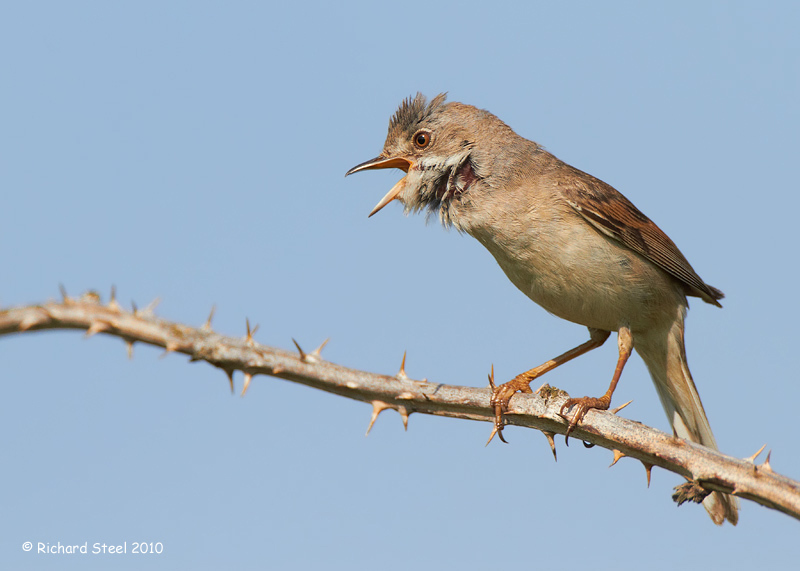 No matter how careful you approach, the bird is going to see you coming and its first reaction is to dive in to the shrub and make a low churring sound, which is the alarm call. After a few minutes the churring stops and you will see a small head pop out of the foliage to inspect you. This goes on for several more minutes from various parts of the shrub until eventually the bird decides your not a threat and continues on with its singing activities on top of the shrub. 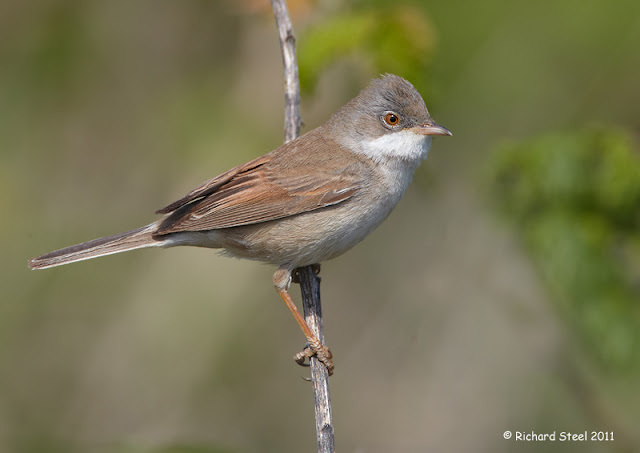 They are not the most colourful bird but are still attractive with their muted colour palette of a chestnut coloured back, buff breast, grey head and of course that prominent white throat patch from which they derive their rather unimaginative name. Another feature of Common Whitethroat, like many other Sylvia warblers, is that they always give the impression of being an 'impaitent' and 'angry' bird. 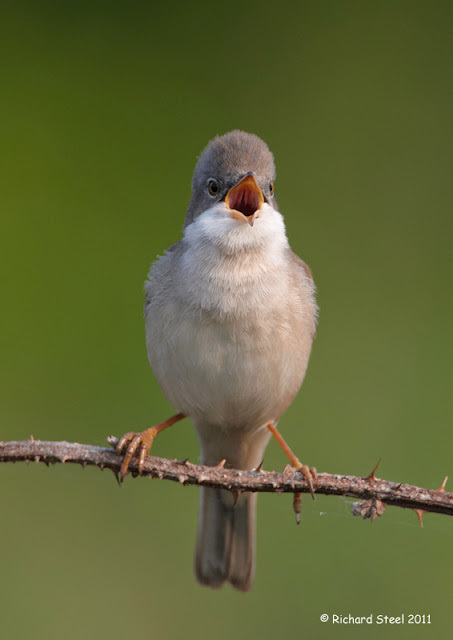 I don't like to assign human emotions to wildlife but 'angry' fits this birds character perfectly, particularly when in song. I think its the combination of that hesitant scratchy song combined with the look of the bird that gives this impression. I think the red / orange eye colouring complete just adds to the whole surly image. 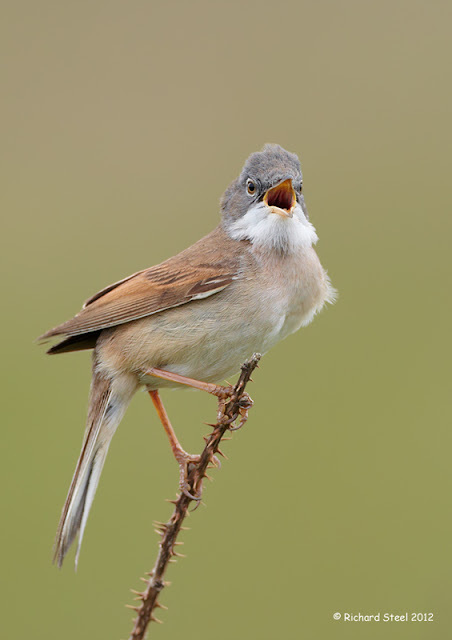 The bird in the photograph below, from a couple of years back, I found in late May and it had taken up residence on the edge of a car park and seemed to be generally unhappy with the whole world around him. There were many people coming and going in the car park and it appears he was less than impressed by all the activity given that his young had fledged and were hopping around the cars. 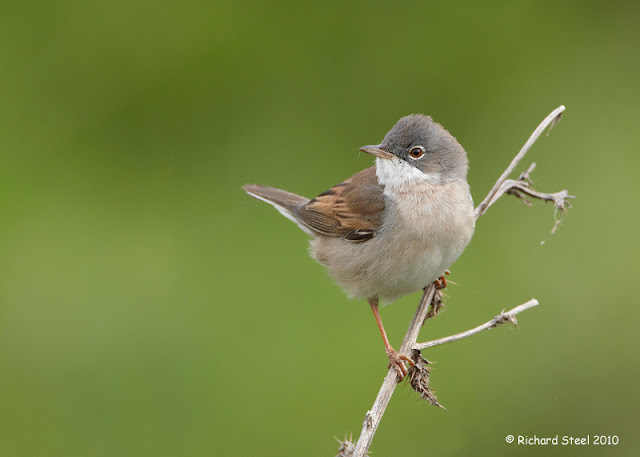 As I have quite a large library of Whitethroat photographs, I do not tend to target them as much as I once did with my attentions turned to other species. However, I still like to have a least one short session with the birds each year are they are great fun to watch and photograph. This last photograph is an obliging bird that I spent a couple of hours with this spring and I sure next year is unlikely to pass without at least one of these 'angry' warblers putting in an appearance in front of the lens. As always I will look forward to that encounter. Richard, I always enjoy your eye-candy bird photography! I also enjoy your write-up describing the bird behaviors. Well done! Happy Birding! Very thorough Richard nice work! Great shots as always. You provide such a nice view into the Old World birds. Wonderful narrative and outstanding photographs! It's always fun to learn about a bird I am unfamiliar with. Fantastic post! The whitethroat is no doubt angry you just anthropomorphized it. Nice post.